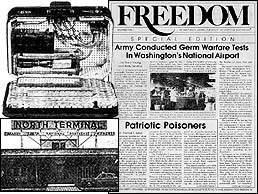 Testing documented by Freedom included spraying bacteria on passengers in Washington, D.C.s National Airport. A suitcase was specially rigged so that agents could spray passengers without being detected. Freedoms investigations into MK-ULTRA and related projects also resulted in the exposure of massive psychiatric testing of dangerous, mind-altering substances on unwitting subjects. The drug experiments took place under the sponsorship of the CIAs Technical Services Staff, the agencys Office of Security, or the Army Chemical Corps. One of the substances, a hallucinogen called BZ, was developed as an incapacitating agent for use against opposing military forces. Ten to 100 times more potent than LSD, it caused delirium for as long as four days, with other effects continuing far longer. According to Army calculations, BZ was so powerful that the amount in the Armys inventory50 tons at the time Freedom published its articles in 1979 and 1980could kill every person in the United States four times over or incapacitate 10 times the worlds population. In tests in the 1950s, 1960s and 1970s at Edgewood Arsenal in Maryland and elsewhere, researchers administered BZ and other biochemical substances to an estimated 6,000 American service personnel, a number of whom later approached Freedom to talk about the lack of information or warnings about the effects they experienced, and the effects themselves. I was out of my mind for 48 hours or more, said one soldier. When I eventually returned home, said another, my parents were very, very concerned. I had changed. Anothers daughter was born with serious birth defects, including both kidneys on one side, brain abnormalities and partial paralysis. Gottlieb himself slipped LSD into the drink of fellow CIA employee Frank Olson, whose personality altered radically. Shortly thereafter, Olson, even though under watch by a fellow CIA employee, crashed through a closed window and plunged 10 stories to his death. Throughout its exposure of harmful biological and chemical testing programs, Freedom and the Church of Scientology also took measures to ensure survivors of the testing programs were located and assisted, and campaigned to eradicate the use of chemical and biological weapons. Freedoms exposure of the testing of BZ  a drug 100 times as potent as LSD  on unwitting American servicemen led to U.S. Army measures to destroy chemical weapons stockpiles and to provide restitution to victims. Meanwhile, Freedoms exposes continued. In April 1981, the Army announced it had destroyed a small portion of its BZ stockpile and was developing long-range plans to burn it all. In May 1989, at a specially constructed disposal facility at Pine Bluff Arsenal in Arkansas, 200 workers operating under tight security set to work dismantling BZ canisters and burning their contents. In September that year, the Army announced it had completed destruction of its entire BZ stockpile. In January 1990, it announced that some 721 tons of residual debris had also been destroyed. The plant itself was locked shut, never to be reopened. Today, plans are in progress to eradicate all chemical weapons in the Army inventory by 2004. Throughout its coverage of chemical and biological warfare testing, Freedom relentlessly urged that rights of victims be restituted, illegal acts by officials responsible be prosecuted, and that funding for chemical and biological weapons be cut. Some victims or their survivors have since been compensated. One of those unwittingly tested, James Stanley, was awarded $400,577 in compensation in 1996 after Florida Congressman Harry Johnston sponsored a private bill on his behalf. At the time the award was announced, military spokesman James Allingham reaffirmed that such drug testing had ended and would never be considered today. One of the most tragic episodes involving chemical agents has been the suffering caused to Army veterans by Agent Orange, a defoliant widely used in Vietnam which contains the lethal chemical dioxin. Freedoms investigation into negligence in treatment of Agent Orange victims featured an exclusive interview with an official who disclosed a government strategy to outlast Agent Orange survivorsrather than seek effective means of dealing with their problems. The official, who worked for years with veterans exposed to Agent Orange, also revealed that a high percentage of women exposed to Agent Orange in Vietnam had since had hysterectomies because they feared having deformed children. Freedom also disclosed the results of an unpublished study which showed that more than 30 percent of American women who had served in Vietnam and had later become pregnant had suffered one or more miscarriages or stillbirths. Many groups and individuals worked to achieve restitution for the countrys affected veterans. Weeks after the 1988 publication of the results of Freedoms investigation, the U.S. Supreme Court declared certain veterans to be eligible for compensation for exposure to Agent Orange. Not long afterward, a restitution plan was worked out whereby some 30,000 veterans and 18,000 members of survivors families would receive payments, in addition to the $52 million set aside for grants to agencies serving Vietnam veterans and their families. During Freedoms investigationwhich included more than 100 interviews with veterans and family members, doctors treating them, and officials from the White House, the Pentagon, the CIA, and the Department of Veterans Affairsa clear picture of the truth began to appear. And changes began to occur; changes so fundamental that one source who had lost his position at a major university because he insisted there actually was a contagious disease was contracted by the Pentagon to train its experts on how to detect and treat the illness. So apparent today is the validity of Gulf War Illness that films are being made about its effects on the lives of servicemen and their families, further raising awareness of the problem and the need for full solutions. Since 1978, Freedom has also published an ongoing series of articles entitled The Drugging of America which has exposed reports of drug smuggling, money laundering and related illegal activities involving government figures. With the help of local, state and federal law enforcement officials, as well as members of the news media, Freedom presented accounts of how, in the 1970s and 1980s, an international, multibillion-dollar cocaine transport operation established itself on American soil and operated with the knowledge or even cooperation of certain government officials. As described in the series, corrupt officials allegedly helped to cover up illegalities that included unique aircraft modifications so literally tons of drugs could be flown into the United States and weapons transported out. As part of one clandestine operation, known as Operation Watchtower, 106 aircraft flights, allegedly bearing cocaine, were made between Colombia and Panama, with the help of U.S. Special Forces personnel. The ultimate destination for much of the cocaine: the United States. The author of the articles on Operation Watchtower, the late Colonel William Wilson, had worked with the Armys Office of the Inspector General and was the officer primarily responsible for documenting the March 16, 1968 slaying of 347 unarmed Vietnamese civilians by American troops at My Lai. Wilson turned to Freedom to publish results of his research into government involvement in drug trafficking. As he put it, he felt he had nowhere else to go with a story that was so haunted by terror and unexplained death that it eclipsed anything he had encountered during his investigation into the My Lai tragedy. Recognizing that exposure of wrongdoing in any system or effort is only half the formula for constructive change, Freedom has also served as a forum and advocate for effective solutions. Freedom will continue to abide by a mandate that supports ways to help make a government truly of the people, by the people, and for the people.